Portions of NeverBoxer are copyrighted, therefore the author no longer authorizes copies, portions or modified code from NeverBoxer to be posted, distributed or otherwise manipulated on this website or others without written consent. 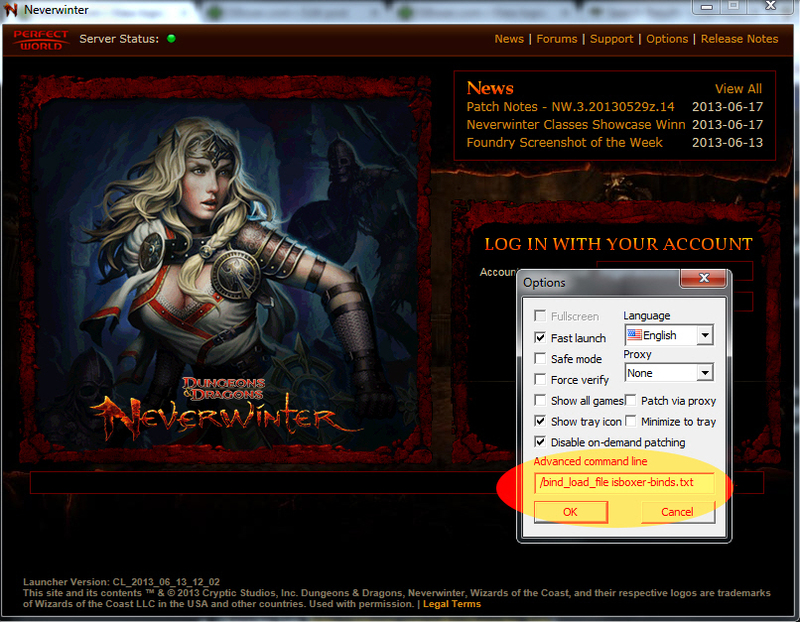 Instead, instructions on how to obtain the NeverBoxer 1.1a config may be obtained by emailing NeverBoxer@Gmail.com. I've seen a few comments in the forums on how poorly Neverwinter performs when multiboxing. The fact is, Neverwinter's engine is very robust and somewhat demanding, even of the beefiest gaming rigs out there. Throw ISBoxer into the mix, and you have to start making some tweaks and comprimises to get the optimal multi-boxing experience. I have two computers that I use to play Neverwinter - a high-performance gaming rig that I built (watercoooled i3570K @4.5 Ghz, 32 GB RAM, 1.5 GB Hybrid SSD/HDD, Win 7 Pro & dual ATI 7970 Crossifre) and a nice little Toshiba laptop (i5 Dual-core 460, integrated Intel & Nvidia 310M, 8GB RAM, 750 GB Hybrid SSD/HDD on Win 7 Pro). They represent opposite ends of the spectrum and have forced me to delve deeper into Neverwinter's graphics settings in order to wring out the max performance for each system. But what we really want to focus on here is getting max graphics on your SLOT1 character's screen at a decent fps (20+ for Neverwinter) while driving 2-4 slave characters in SLOT2-5 off screen or in mini-windows. Luckily, Windows Aero's screen API lets us have VFX at little performance cost, so don't think that having lots of VFX screens everywhere is going to be a big drain. The largest drain on your system is going to be CPU cycles and memory. Neverwinter is a very CPU intensive game, so having a strong CPU (i5 or greater) will make a big difference. - Consider changing your Processor scheduling to "Background services". 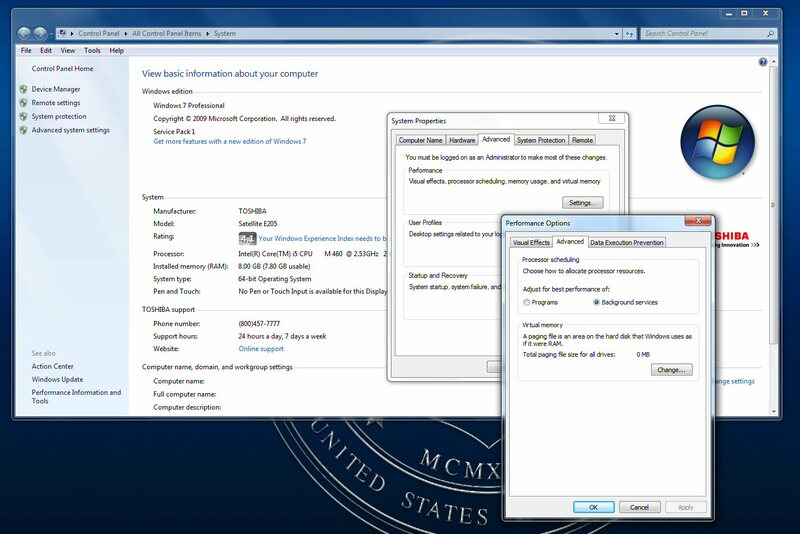 You can find this setting by right-clicking on "My Computer" (or Computer depending on your Windows version), choosing Properties and going into the Advanced System Settings. Normally you would prefer programs, but with multi-boxing, my testing has shown that juggling 5 different game windows, each with their own HDD and network accesses running independently, having this type of scheduling enabled makes everything run smoother in the end. You can test the "Programs" setting on your setup and see how it reacts for your system. - Consider an SSD or Hybrid SSD/HDD. These don't necessarily give you better FPS, but cut down on the hard disk lag caused when loading during gameplay. - If you are going to use a wireless connection, make sure that nobody is walking over your wireless channel causing interference. Use a wireless network tool to see what the channel usage is where you are gaming at and adjust your router to make sure you have a wireless channel all to your greedy, multi-boxing little self. I use a program called NetSurveyor ( http://nutsaboutnets.com/netsurveyor-wifi-scanner/ ) to scan the local networks and adjust my frequency channel to one that is lightly or not used at all. If you have any of those 802.11 A/B devices on your network and your router is downgrading your wireless speeds because of them, just turn them off or put into "airplane mode" for the duration of your gaming session - this can help. Also avoid streaming HD video on other devices or downloading large files on your network during multi-box gaming sessions. Remember - your're pushing several game sessions across one network connection and HD video competes for the bandwidth you need on your network connection. 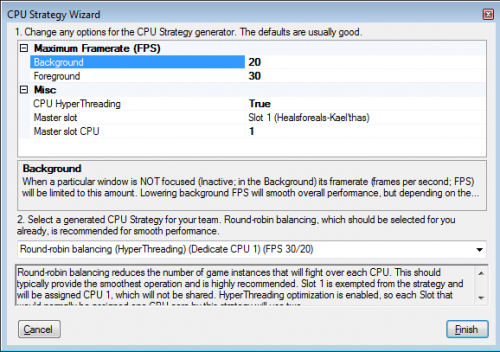 - CPU Strategy WIzard: One area specific to ISBoxer that needs to be addressed up-front is CPU Utilization. ISBoxer has a CPU utilization wizard that can be used to slice up your CPU's cores and cycles using various scheduling methods to obtain better performance when multi-boxing. I've noticed on my high-performance gaming rig that leaving the CPU utilization up to the game gives me 10+ fps over the Round-Robin option of ISBoxer. BUT - that is the exact opposite on my laptop, where the Round-Robin is better. This means that it is highly system specific. I strongly suggest you try different CPU settings and test them to see what gives you the smoothest gameplay. 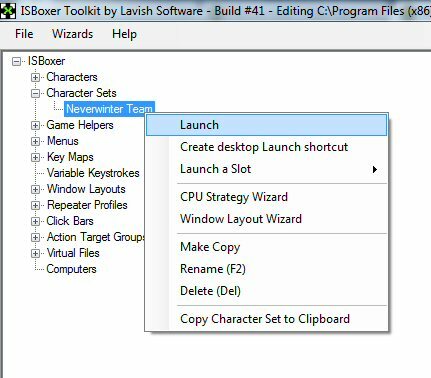 Before we begin, make sure you are in ISBoxer and launch all of the characters. This way when you configure the various characters their video settings will save to that character. If you don't, they will overwrite each other and they will all be the same. Normally you start with your SLOT1 character, but for now as an example, let's set up the first slave. Inside the game itself, go into the options menu and let's start adjusting the video settings... I will show you two series of in-game screenshots - one series for the SLOT2-5 slaves and another series of screenshots with settings for the SLOT 1 master (used by your main character for multi-boxing) . What you are trying to accomplish is minimizing the settings for the slaves to enable you to have better performance for the master. Let's start with the slaves since that's what will determine how much detail we can add to the master (SLOT1) later on. Watch the FPS and network ping speed display and write down the "average" scores of each. Once you are done tweaking, you can compare them to where you started from to get an idea of how successful your changes were. Then when you really want to test things out, go to "Protector's Enclave" where there are literally dozens of people running and around and test your FPS and network speeds there. They will be much lower - which is normal. You want to try and adjust your settings so that you can comfortable navigate around town, otherwise every trip you make through there will be rather laggy and painful. The most important setting to note is the rendering scale. This option allows you to lessen the overall resolution of the rendered screen display to gain a noteable performance boost at the expense of overall graphics fidelity. What is nice about this option is that although you might render the 3D graphics at a lower setting, the interface is still drawn at full screen resolution - this allows a sharp display of your HUD and text while the rest is at lower detail. This is PERFECT for our slaves! So drop the rendering scale to the absolute minimum - 50%. Since we won't really be playing on these screens and they will be running either behind SLOT1 or in miniature windows it wont matter a bit. And since our HUD is drawn at a higher resolution, the info we need to see will still be sharp and clear. Remember, the screen resolution here should be the same and mirror that of your SLOT1 character's screen resolution. For example below, 1920x1200 is the same across all 5 members of my party... 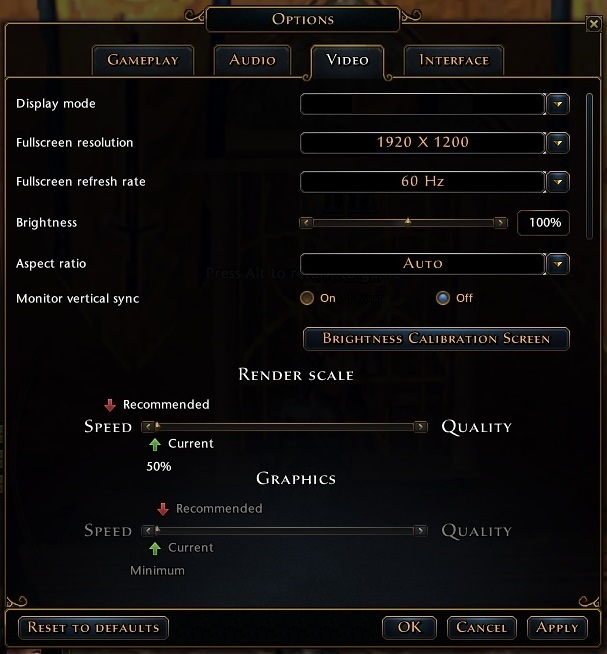 If your graphics card is struggling to achieve a minimum of 20 FPS for SLOT1, consider choosing a lower resolution (1280x768) across all of your party. Also, vertical sync should be OFF for all of your party members SLOT1-5. This increases performance but may result in "screen-tearing"... if you can't stand the tearing, then turn it back on. Othewise enjoy the bonus FPS. Click the "Show Advanced Settings" tab to reveal the "Performance", "Detail" and "Effects" menus. 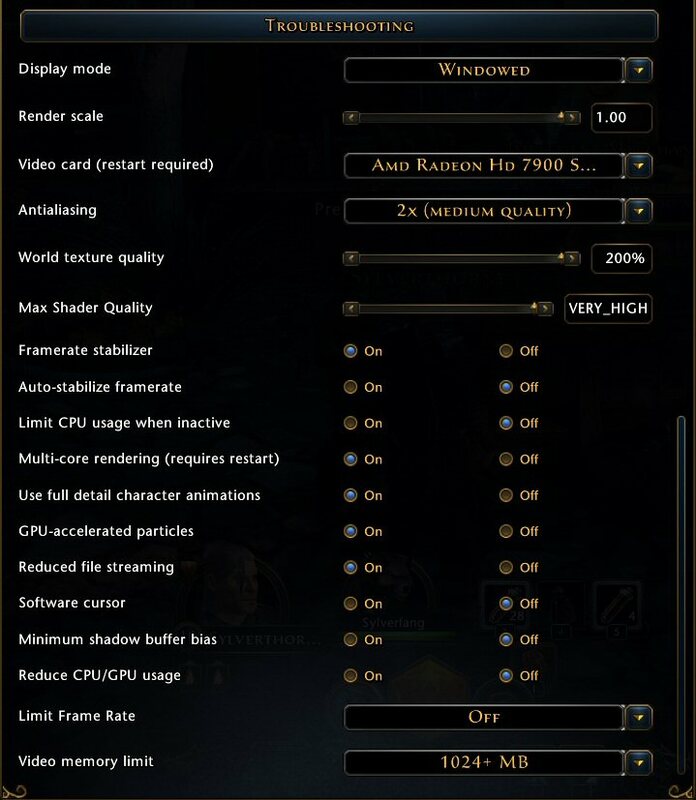 Set the rest of the settings at/close to the absolute minimums - again, we don't need any detail on these slave screens. First is frame stabilization - this is especially useful on your SLOT1 main screen. However, it is not needed in the slaves, so turn it off here. Turn "Limit your CPU usage" ON to free up cycles for the SLOT1 main screen. Turn "Multi Core" ON if you have a multicore CPU - this will make a BIG difference performance-wise. 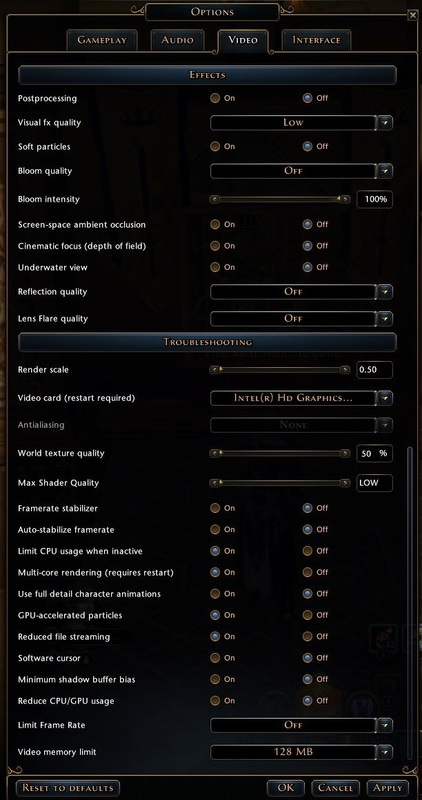 Turn character animations OFF to speed up your slave screendraws. You want to ensure you turn "GPU Accelerated Particles" ON. I know this is a slave screen, but in testing, even with integrated laptop video, the GPU renders particles faster than the CPU implementation. Reduce file streaming should absolutely be ON to minimize HDD access while gaming. HDD and network access cause FPS performance dips in Neverwinter. Turn the next three options OFF and make sure you turn OFF the "Limit Frame Rate" option... ISBoxer will control this for us. Lastly, make sure to set your max gaphics memory usage to 128MB to maximize the graphics memory available to your master (SLOT1) screen, which will need that memory for the higher resolution textures. You can do this under the last setting in this screenshot, labeled "Video Memory Limit". Now for the master (SLOT1). Since you've now setup your slaves, whatever CPU/GPU horsepower remains can be poured into maxing out the master (SLOT1) graphics and Frames Per Second (FPS). Again, most important tool in your toolkit is the rendering scale... if you can't seem to get the overall performance you want, just drop the rendering scale down to 80 or 90%. At that scale, the graphics still look pretty good and give a healthy performance boost. The minmum is probably 70%, after which the graphics quality tapers off rapidly. 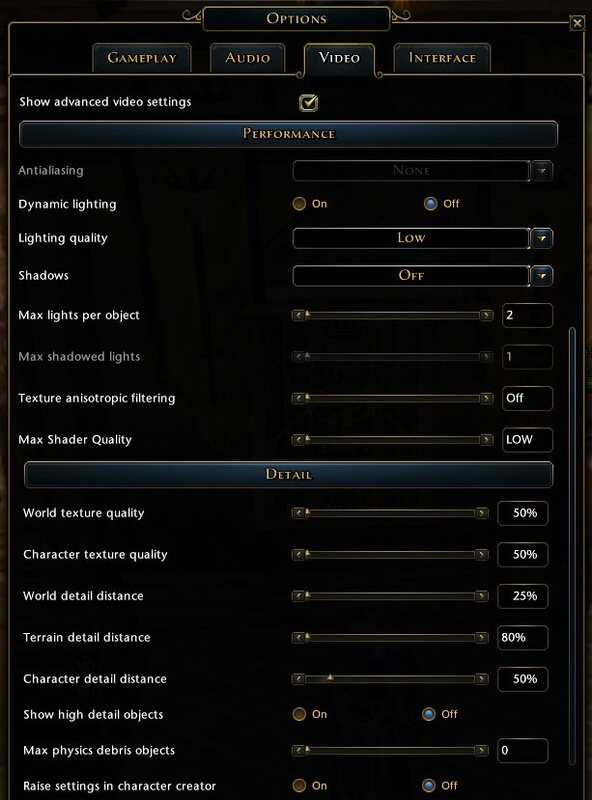 One word of caution - the "Postprocessing" routines of Neverwinter have some serious bugs. I've experienced many errors and screen/system-lags due to the crappy postprocessing in this game. I've opened a trouble ticket and I have also seen this mentioned in various forums - it's a known issue. I do have the latest drivers on both Nvidia and ATI/AMD cards, and it happens on both platforms so just be aware that if you want to minimize these issues to avoid this setting until it gets a bugfix. By scaling back all 4 of my other slaves' settings, you can see that I am still able to run at 2x Anti-ailising and most settings at maximum. I did leave the world and character distance settings at just 100%. Since most of the areas in Neverwinter are not open vistas like Lineage 2 or Tera, it just seemed like a waste of FPS. Since this is your SLOT1 main character, you want to ensure that you leave the "Limit CPU usage when active" off to potentially maximize available CPU cycles. The same applies for the "Reduce CPU/GPU" setting below it (this is mainly for laptops to keep them from overheating). To max your framerate, you need to make sure the "Limit Frame Rate" is OFF - and besides, we want ISBoxer to manage all of this through it's settings. Something important to note are the DX11 settings. As of the time of writing, the DX11 mode is still in Beta, and is therefore inherently unstable (I can confirm that it crashes frequently in this mode on my dual ATI 7970s). However, I have read that Nvidia cards gain a 10-20% performance boost by using DX11 if you have a DX11-compatible card. ATI users actually lose 10% by using the DX11 mode. So your mileage will vary depending on your card manufacturer and DX11 capabilties. I'm hopeful that the DX11 code will be optimized by the 20 June release date and that ATI will fix whatever issues are plauging their drivers! Again, its most important to remember that the largest performance gain is made by adjusting the rendering scale. Last edited by Sylver on Fri Jan 15, 2016 3:56 am, edited 47 times in total. Wow again thanks for this guide, I finished getting my main dude to 60 today. I will start working again on my 5 man grp and I will give this a try. I noticed that you don't have the Disable on-demand patching checked on your screenshot is that the way that is suppose to be, cause you said that is good so it doesn't download it during gameplay. The other thing is I can't seem to find the option for troubleshooting video in the game that whole screenshot u got there. Also, do you have 2 copies of the game locally on your PC, 1 for Slot1 and the other one for the slaves, cause when I change the settings on 1 it changes it on everyone. I have only one copy. Make sure to launch your characters from ISBoxer and then you can configure them individually. I think u mean Innerspace right? I have I go to Innerspace and then Isboxer Character set, but it changes all at once. Il try opening all of them and see. Ahh sneaky bastards, you have to scroll all the way to the bottom and check where it says Advanced Video settings. Ok I tried doing it when all characters are up I even saved the UI to see it it would save but still no luck every time I reopen the set they all have the same video settings. Maybe is the way I close the windows? I tried Exit button from within game maybe I have to click the red X from windows itself, I will try that next. zandokan wrote: Ok I tried doing it when all characters are up I even saved the UI to see it it would save but still no luck every time I reopen the set they all have the same video settings. Maybe is the way I close the windows? I tried Exit button from within game maybe I have to click the red X from windows itself, I will try that next. Ok, it is certainly working 100% for me. Im launching my character set from inside ISboxer (right click on the character set name) and it launches characters 1-5 in succession. SLOT1 is max graphics, and SLOT2-5 are low-res as in my above guide. Now, there are settings for the character set and window layout's "instant swapping" that may affect this (although I'm not certain). The instant swapping makes the resolution for all screens the same. Here's some screenshots for you to look at. Maybe make your settings mirror mine - perhaps it will fix your problems? Last edited by Sylver on Wed Jun 12, 2013 3:10 am, edited 1 time in total. Sylver wrote: If you have 16GB or more - you are golden! If you have 16GB or more, consider turning off your Windows page file (sometimes called swap file) to make Windows minimize system hard disk activity. Just realize that if you exceed your system's overall RAM without one, it will crash your system. You probably shouldn't be telling people to disable their page file because depending on their system, this can have major repercussions. Everyone's system is so different and there's no way you can know who runs what programs at this moment in time and what they're going to be running in the future. Saying, "I've been doing it for 5 years now with no problem!" doesn't mean anything when you're writing a guide that hundreds of people, with vastly different system setups, may end up reading and following. If someone disables their page file and ends up with odd system activity or sporadic crashes, it's doubtful that they're going to remember they disabled it and they're going to be stuck wondering what's going on -- Especially since I believe disabling the page file doesn't let the computer do a memory dump on the event of a bluescreen. If anyone is hurting for that much performance, then disabling the page file will probably not stop the inevitable need to purchase new hardware. If you're going to keep that bit in the guide, then I would suggest telling people to just decrease it to the minimum recommended size which is like 400MB or something, but even then, that really only saves on HDD space.